We require a minimum order of 12 pieces for a one-color, one-location print. Minimums increase with the number of print colors and print locations. How do you handle re-orders? Re-orders can be placed, but keep in mind that minimums will apply. We recommend ordering a few extras with your initial order to avoid having to place a minimum re-order. Do you guarantee exact quantities? We do not guarantee exact quantities due to defective garments or occasional misprints. If you must have exact quantities, we recommend ordering a few extras to make sure your numbers are covered. Can I mix and match garment styles and colors? Yes. You can mix and match garment styles and colors AS LONG AS the same artwork and print colors will work on ALL garments. If the artwork and/or print colors are different, then new minimums will apply. You can view our online catalogs by clicking here , or you can request a catalog by emailing or calling 877-804-7507. Can I get sample garments (NO DECORATION)? Yes. Undecorated sample garments can be ordered at a discounted price plus $5 shipping. Items cannot be returned or exchanged after they have been printed unless we are responsible for an error or the garment is found to be defective. It is extremely important that you review all artwork proofs for errors. Once your approval is received, we proceed with decoration. Our setup fees are included in the price of the garment. Don’t be fooled by others who offer “free” setups. More than likely the fees are figured into the garment price, but not disclosed. Do you do custom designs? How much does it cost? AI, EPS, PDF, JPG, TIF, PSD. We can provide you with more specifics when it comes to submitting art. Typical turnaround time is 10 business days after final art approval. However, we can work closely with you to meet any deadline. Can I see a printed sample before my order is filled? Due to the time and cost associated with set up, printed samples are not available. We will provide an electronic proof before printing is started. The proof will represent colors, image size, and placement. Printing will not begin until the electronic proof is approved. You can see our samples by visiting our Portfolio page. Where do I find your pricing? Because every job we do is different, we do not have menu pricing. To receive a quote you can contact us through our Contact Form or call us at 877-804-7507. Do you require a deposit when placing an order? We ask for half the payment at the time of order. The rest is due upon pick up or delivery. We prefer cash, checks, or money orders. We do accept credit and debit cards, but these forms of payment will incur a lost-cash discount of 4 percent. We require a minimum order of 12 pieces for apparel and a minimum of 24 pieces for headwear. Yes. You can mix and match styles and colors AS LONG AS the same design is embroidered on all items. However, apparel and headwear cannot be combined. If thread colors must be changed to accommodate garment colors, there will be a thread-change fee of $10. Can I return embroidered items? Items cannot be returned or exchanged after they have been embroidered unless we are responsible for an error or the garment is found to be defective. It is extremely important that you review all artwork proofs for errors. Once your approval is received, we proceed with decoration. 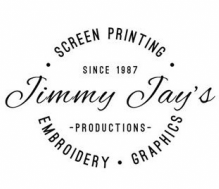 Set up charges can vary depending on size and detail of the design to be embroidered. Please contact us through our Contact Form or by calling 877-804-7507 for a quote. Can I see an embroidered sample before my order is filled? We will provide an electronic proof before embroidery is started. The proof will represent colors, image size, and placement. Embroidery will not begin until the electronic proof is approved. • Embroidery cannot be as detailed as screen printing. • A good rule of thumb is if something cannot be written clearly with a Sharpie marker it will not work well with embroidery. • We cannot convert a large digitized design to a hat or chest design, or vice versa. This would require a separate setup.